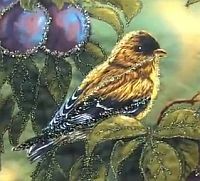 appliqué, blackwork, crazy quilting (hand), crewel, cross stitch/counted thread, doll making (hand), hardanger, Japanese embroidery, lace making, miniatures, needlepoint/canvas work, punch embroidery, ribbon embroidery (hand), silk gauze/Polysil" embroidery, smocking, stumpwork, weaving. 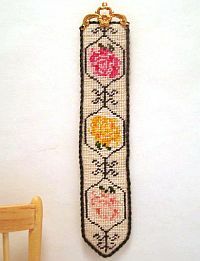 Silk Mori® is ideal for cross stitch, samplers, crewel, hardanger (as in woven bars and picots), stumpwork, crazy quilting, and needlepoint or canvas work. It offers a luxurious sheen unattainable with cotton floss, and your fingers will love it. Use one or more strands depending on the ground material and the effect you want to achieve. Silk Mori® should only be dry cleaned. Do not wash or wet block silk work. 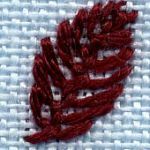 Do not use an embroidery hoop with silk thread in hand stitchery, as the rings, markings or folds left in the fabric cannot be removed by washing the piece. Instead, use stretcher bars, Q-snaps, or scroll frames. The dye lots of Silk Mori® are very stable, but with any thread, including silk, wool, or cotton, we recommend ordering enough thread in each color for your project to ensure receiving the same dye lot. 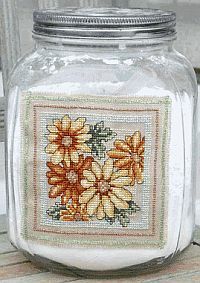 To keep your stitching looking its best, take time to wash your hands before stitching. Use a non-greasy hand cream to moisturize hands and prevent the silk from snagging on dry skin or cuticles. Prepare your ground material (fabric or canvas) prior to stitching to prevent the silk from snagging on rough edges. Turn the edges under with a running stitch, or cover the edges with tape. To access Silk Mori® in its skein form, remove the paper wrapping and loosen the slip knot holding the ends together, then cut the required length (save the paper for future reference). We recommend using lengths of silk no longer than 45cm (18 inches) for better thread control and reduced thread abrasion from repeated passes through the ground material. 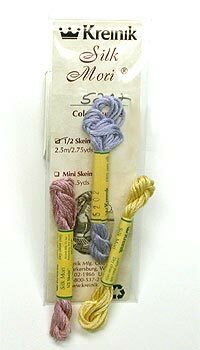 Separate the strands of Silk Mori® and recombine the appropriate number of strands before threading the needle. This will produce an even and consistent appearance. To avoid snagging, tangling, or knotting, pull out one strand at a time, straightening the thread after each strand has been pulled out. Use a needle large enough to 'open' the hole in the fabric to allow the silk thread to go through easily. A laying tool such as a Tekobari, Bodkin or Trolley Needle is helpful in keeping the strands parallel and separate while stitching, thereby getting the most from Silk Mori®'s sheen. If you don't have a laying tool, use your needle or a large Tapestry needle to keep the strands parallel and carefully lay them on the ground material. If you have problems with tangling or knotting, let your needle hang frequently as you stitch to return the thread to its natural twist. 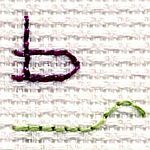 Stitch using the 'stab' method rather than the 'hand sewing' method to reduce tangling, working your stitches in two movements: up vertically then down vertically through the fabric.